We consider the problem of learning both the structure and the parameters of Probabilistic Description Logics under the DISPONTE semantics. 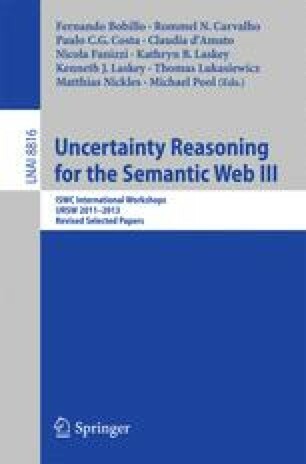 DISPONTE is based on the distribution semantics for Probabilistic Logic Programming and assigns a probability to assertional and terminological axioms. The system EDGE, given a DISPONTE knowledge base (KB) and sets of positive and negative examples in the form of concept assertions, returns the value of the probabilities associated with axioms. We present the system LEAP that learns both the structure and the parameters of DISPONTE KBs explotiting EDGE. LEAP is based on the system CELOE for ontology engineering and exploits its search strategy in the space of possible axioms. LEAP uses the axioms returned by CELOE to build a KB so that the likelihood of the examples is maximized. We present experiments showing the potential of EDGE and LEAP.